Friday's showdown will be their 52nd meeting overall — the most for any pair of men and 14 more installments than Federer vs. Nadal — and first at the All England Club since 2011. 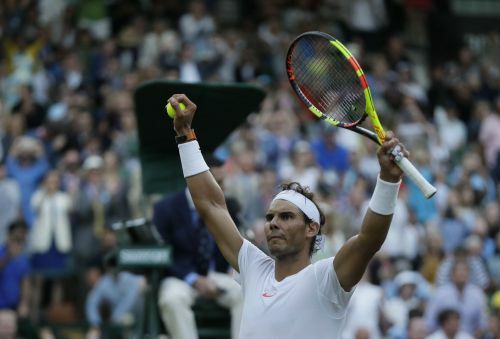 "We always played in important stages, important places," said Nadal, who had a far rougher go of things in the quarterfinals than Djokovic, needing more than 4½ hours to edge Juan Martin del Potro in a five-set thriller. "Friday is another important match against an opponent that is one of the most difficult ones that you can face. He's playing well. Only way to try to win it is (to) play very well." With the increasingly physical nature of rallies, the advances in training and nutrition that help extend careers, and the dominance of a certain trio of all-time talents — Federer has 20 Grand Slam titles, Nadal 17, Djokovic 12 — it's been hard for any youngsters to elbow their way to the top.